The Nectar mattress has become one of the most well-known mattress brands in the country. If you’ve heard of this, it’s very likely because you know someone who owns one or you’ve at least seen an advertisement. With skyrocketing popularity, is this a brand you’re considering investing in for yourself? Since this is a relatively large purchase, it’s important to do your research in order to make sure the Nectar mattress will offer exactly what you want and need out of a bed. To help with this, the Nectar mattress review below is an excellent resource to utilize. It’ll tell you all you need to know so you can buy with confidence! –Does it Have Good Reviews? –What Should You Place it on? –What if I Decide to Return? –Should I Buy This Mattress? This company was started with the ultimate goal of making an affordable mattress that was also incredibly comfortable. To do this, Nectar’s founders listened to what mattress buyers had to say and designed a bed that was different from all others. The team consists of some of the most experienced mattress professionals out there today, each of which is dedicated to bringing you a better night of sleep. If you want to buy from a company that cares about offering a quality mattress, then you can feel confident buying from Nectar. Yes. Surprisingly, Nectar offers an incredibly 365 sleep trial. This is by far the longest sleep trial for these types of beds. If you don’t want to risk making an investment you may not enjoy, then this sleep trial can give you peace of mind. An entire year is really more than enough time to determine whether or not you like this mattress and if you want to keep it for the following several years. If you’re like most buyers, you’ll actually know whether or not you want to keep this within just a few weeks. If you decide you don’t like the mattress, whether during the middle of the sleep trial or end of it, then you must contact Nectar. They’ll walk you through the return process so you can get the bed out of your home. Nectar mattresses are designed with several layers that are meant to help provide you with adequate support as well as incredible comfort. These layers are placed under a soft and comfortable cover that feels great on the skin and will help protect the mattress underneath. – Base Layer: The bed construction begins with a base layer of polyfoam. This offers sturdy support and also helps the bed keep its shape over time so you can rely on this to last for years to come. – Layers 2 and 3: On top of the base layer you’ll find a thick layer of memory foam that is sort of a transition layer between the base. This isn’t as soft as the top layer, although that’s for good reason. This is meant to provide support and spring so you are more comfortable and are able to get up of the bed without sinking down. On top of this is a 3″ layer of soft and cozy memory foam. This responds to the pressure of your body to provide relief to your joints and help you wake up feeling more refreshed. In addition to this, it helps distribute your weight more evenly so you are less likely to wake up throughout the night from being uncomfortable. – Top Layer: The very top of the Nectar mattress is designed with 1″ of soft gel memory foam that is designed to help keep you cool at night. It’s this layer that does most of the work in terms of making sure you’re comfortable, so it’s something you’ll appreciate from the moment you lie down at night. Overall, the construction of the Nectar mattress is pretty solid. It has all the layers that are needed to create a bed that’s both soft and comfortable. However, it’s important to keep in mind that this is only made with memory foam rather than several different materials. Fortunately, it’s still very comfortable and is something that most individuals can easily sleep on. This bed marks “middle of the road” when it comes to firmness. In general, it’s medium-firm, which is universally liked for most sleepers. If you prefer something softer or more firm, then it’s important to consider this when shopping around. 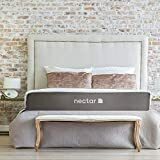 For most buyers, the Nectar mattress is a great combination of both firm and soft without being too much of one or the other. When lying down on this bed, the first thing you’ll likely notice is that the cover is soft and provides adequate support despite it allowing your body to sink down. As you sleep, you should stay comfortable without having to worry about sinking too much or feeling like it will be difficult to get out of bed. Edge support is a mattress detail that most people don’t think about. However, it’s one that’s important. Edge support will ensure you can sleep on the edge or even sit on it without feeling like you’re going to slide off of the mattress. With the Nectar bed, the edge support is surprisingly great. It performs similarly to more expensive beds, which is something to be said. While it may not be the very best out there, the edge support is more than adequate for most sleepers. If you are the type of person who is easily awoken or disrupted when your partner moves around the bed, then motion transfer is an important detail to think about. Fortunately, memory form is the best material for minimal motion transfer. What’s even better is that the Nectar mattress shines brightly in this category and has very little bounce or movement across the bed. Your partner can easily move around without disrupting you, which is a huge selling point for many buyers. Yes. Another astounding feature of this mattress is that it comes with a lifetime warranty. They even go a step beyond by offering a replacement mattress if an impression deeper than 1.5″ occurs. This is a warranty that you won’t find with the majority of other mattress brands out there. In fact, we can’t think of one bed that offers this same warranty along with the incredibly long sleep trial. No. Nectar is one of the most affordable memory foam mattresses on the market today. Right now, you can get a California King for under $950 dollars (before tax). On the flip side of this, you can get a twin for under $550 (before tax). With free shipping with your purchase, it’s easy to see why this bed is so wildly popular. By cutting out the middleman, Nectar truly does save consumers a whole lot of money on their mattress purchase. With some mattresses being made with dangerous chemicals and questionable materials, it’s important to know what goes into yours. Fortunately, with Nectar, you won’t be disappointed. This is a safe mattress to bring into your home, beginning with the fact that it’s OEKO-TEX Certified. This means it has undergone rigorous checks for harmful chemicals, including those that are not legally regulated. Additionally, it’s CertiPUR-US Certified, which means it’s made with non-ozone depleting foams and without heavy metals or formaldehyde. Online reviews are some of the best tools when it comes to buying just about anything online. While you will find negative reviews of this mattress here and there, the vast majority are overwhelmingly positive. In fact, there are thousands of Nectar mattress reviews online, which makes it easy to see what people like and dislike about this mattress. While it’s true that other beds do have similar ratings, this one takes the cake thanks to the qualities that set it apart from all other choices out there. What Should You Place it on? Nectar says that their mattresses can be placed on any existing foundation you might have. However, if you’re looking for something new, then they do have foundations available to purchase. These will fit your new mattress like a glove and are admittedly cheap, so they are well worth investing in to make your sleep more enjoyable. Nectar even has an adjustable frame that will allow you to adjust your sleep position for optimal comfort. The split mattress goes a step beyond this by allowing both you and your partner to customize your position according to each of your preferences. Like with any mattress, there are pros and cons to the Nectar mattress. Fortunately, there are many more pros than there are cons. You can find some of these below. This is one of the most affordable mattresses on the market today, especially considering the fact that free shipping is included. It will be difficult to find another sleep trial that lasts as long as Nectar’s 365. This is by far the longest out there and more than enough time to determine whether or not you like sleeping on this bed. The warranty that comes with this mattress is incredibly generous, as it lasts a lifetime. In addition to this, deep 1.5″ insets will mean a replacement. The design of memory foam is both smart and effective. It produces a mattress that is perfectly comfortable without being too soft or too firm. If you’re looking for something that you can sleep on without tossing and turning from discomfort, this very well may be it. If you get hot at night, then this is a bed that can help reduce your discomfort. It’s made with cooling gel and a cover that wicks away moisture so you’re more likely to stay comfortable as you sleep. Nectar measures 11″ thick due to its base layer. While this isn’t a problem for most buyers, it’s important to think about if you have a low-profile bed. It’s one of the thickest memory foam mattresses available today. Due to the fact that Nectar as a company hasn’t been around that long, it’s difficult to say how long the mattress will last. However, with the lifetime warranty, you should be covered for any manufacturing defects. Many buyers today are looking for mattresses that are sourced and created in the United States. Nectar does not fit this need, as it’s sourced outside of the country and made in China. However, it’s still a quality bed for those who are looking to save money. You can purchase your Nectar mattress right from the website for the company. However, if you’d like to save some time and potentially money, then you can purchase this mattress on Amazon as well. Visit the following link and you’ll be able to see the mattress, reviews, and quickly order to have it delivered to your home. What if I Decide to Return? Remarkably, this company does offer free returns for those who do not wish to keep their mattress. When compared to other companies that make you pay for this service, this will save you hundreds of dollars. However, keep in mind that once the mattress is taken out of the box, it is more difficult to move around. You’ll appreciate having someone there to help you make this easier. Should I Buy This Mattress? If you take anything away from this Nectar mattress review, it should be that it’s a solid choice that stands out among all others. From the incredibly long sleep trial to the generous lifetime warranty, you will be hard-pressed to find something similar. In addition to this, the materials are high-quality and the comfort is solid. You can easily sleep on this night after night without regretting your choice of purchasing, which is a big deal with something you use so frequently. Overall, this is a great bed that thousands of people love and it just may be the right one for you as well!